Synthetic peptide within Human CD9 aa 200 to the C-terminus. The exact sequence is proprietary. WB: HeLa, HuT-78, MCF7 and U87-MG cell lysates. Mouse heart and kidney lysate; Rat brain lysate. IHC-P: Human papillary carcinoma , astrocytoma, brain, kidney and tonsil tissue; Rat spleen tissue. ICC/IF: Mouse peritoneal macrophages. IP: HeLa whole cell lysate (ab150035). Our Abpromise guarantee covers the use of ab92726 in the following tested applications. WB 1/2000. Predicted molecular weight: 25 kDa. Immunohistochemical staining of paraffin embedded rat spleen with purified ab92726 at a working dilution of 1/500. The secondary antibody used is HRP goat anti-rabbit IgG H&L (ab97051) at 1/500. The sample is counter-stained with hematoxylin. Antigen retrieval was perfomed using Tris-EDTA buffer, pH 9.0. PBS was used instead of the primary antibody as the negative control, and is shown in the inset. ab92726 (purified) at 1/20 immunoprecipitating CD9 in 10 μg HeLa (Lanes 1 and 2, observed at 24 kDa). Lane 3 - PBS. For western blotting, a HRP-conjugated anti-rabbit IgG, specific to the non-reduced form of IgG was used as the secondary antibody (1/1500). Unpurified ab92726 showing positive staining in Normal kidney tissue. Unpurified ab92726 showing positive staining in Papillary carcinoma of thyroid gland tissue. Unpurified ab92726 showing positive staining in Astrocytoma tissue. Unpurified ab92726 showing positive staining in Normal brain tissue. Immunohistochemical staining of paraffin embedded human tonsil with purified ab92726 at a working dilution of 1/500. The secondary antibody used is HRP goat anti-rabbit IgG H&L (ab97051) at 1/500. The sample is counter-stained with hematoxylin. Antigen retrieval was perfomed using Tris-EDTA buffer, pH 9.0. PBS was used instead of the primary antibody as the negative control, and is shown in the inset. I just want to know that your product Anti-CD9 antibody [EPR2949] (ab92726) whether can be used as marker of urinary exosomes in case of Western bolting or not. 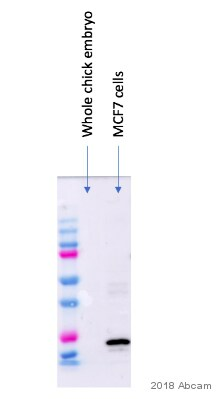 We have not specifically tested this Anti-CD9 antibody [EPR2949] (ab92726) as a marker of urinary exosomes but I can confirm that it can be used in western blot on mouse, rat, and human samples. Additionally, I have done a Google search and found that CD9 is indeed an exosome marker therefore it can be used as you mentioned. For more details about CD9 please see the publication below. If you are also looking for a second antibody and detection reagents to go with this ab92726, here are some recommendation. Hello, I am writing in reference to an anti-CD9 antibody with the Clone ID: EPR2949, and catalog number 2739-1. In the product information, it states that the antibody is cross-reactive with mouse. However, it states that the antibody is recommended for western blot only in mice. I was wondering if the antibody has been tested in immunofluoresence with mice and whether it has been shown to be ineffective for immunofluoresence. Thank you for any information you can give me in regard to this antibody. Yes, this antibody should work in mouse for Immunofluorescence. The reference below (also on our datasheet) has used this antibody for IF in mouse. I recently purchased anti-CD9 [EPR2949] cat# ab92726. Could you please let me know whether if binds to extracellular or intracellular domain of CD9? I can confirm that the immunogen of the antibody ab92726 (Anti-CD9 antibody [EPR2949]) is located in the cytoplasmic part of the protein. 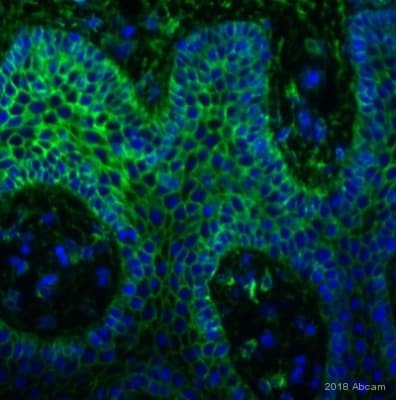 This antibody is tested and guaranteed for WB, IP, IHC-P, ICC and Mouse, Rat, Human. It was tested in flow cytometry and we found it not suitable for this application. I hope this information is helpful and wish you good luck for your research. ... sind wir auf der Suche nach einem Antikörper, welcher Strukturen anfärbt, die in jedem Gewebe nachweisbar sind. Zu diesem Zweck haben wir uns den Anti-CD9 Antikörper (ab92726) ausgesucht. Wir würden diesen gerne zunächstauf unseren Gewebeproben testen, bevor wir größere Mengen des Antikörpers bestellen. Könnten Sie uns hierfür eine kleine Menge des Antikörpers zur Verfügung stellen? Falls Sie den Antikörper für eine andere Anwendung/Technikbenutzen wollen, eine welche von uns nicht getestet und deshalb nicht garantiert ist,lassen Sie es uns bitte wissen. Wir werden dann schauen, ob wir Ihnen einen Testangebot machen könnten. Ich weiss leider nicht, ob CD9 in all Ihren Geweben exprimiert ist. Ich weiss leider auch nicht, welche Gewebe und welcheStrukturen Sie genau anschauen möchten. Nach Swissprot (http://www.uniprot.org/uniprot/P21926) ist CD9 auf hematopoetischen Zellen und Epithelzellen.